It never EVER gets old when I receive word back from an editor that they’ve actually chosen one of my weddings to feature in print. To be honest, it’s way more common to hear “no” than it is to get a “yes”, and with print, it’s just a little extra special because there are just so many weddings to choose from! It’s always an honor to see my clients’ beautiful wedding day featured somewhere, but The Knot Regional is one of my favorites! Carrie + Ryan’s beautiful wedding at Lowndes Grove last year was definitely one of my all-time favorites. 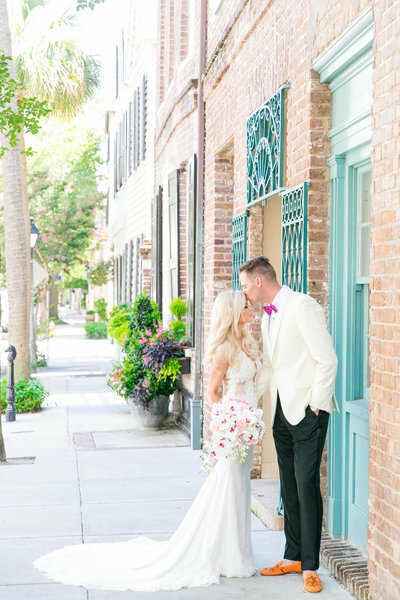 I LOVED their untraditional, yet classic, color palette and design – the ladies of Pure Luxe Bride absolutely nailed it!! It’s weddings like theirs that grab your attention because they are DIFFERENT, but still so gorgeous. In a world full of blush + white weddings, doing something unexpected is always a great idea. Check out Carrie + Ryan’s amazing wedding in a gorgeous 5-page spread in the latest issue of The Knot Carolinas Fall/Winter 2017 issue – on newsstands now!